DD Form 2351 - also known as the "Dod Medical Examination Review Board (dodmerb) Report Of Medical Examination" - is a Military form issued and used by the United States Department of Defense. The form - often incorrectly referred to as the DA form 2351 - was last revised on March 1, 2008. 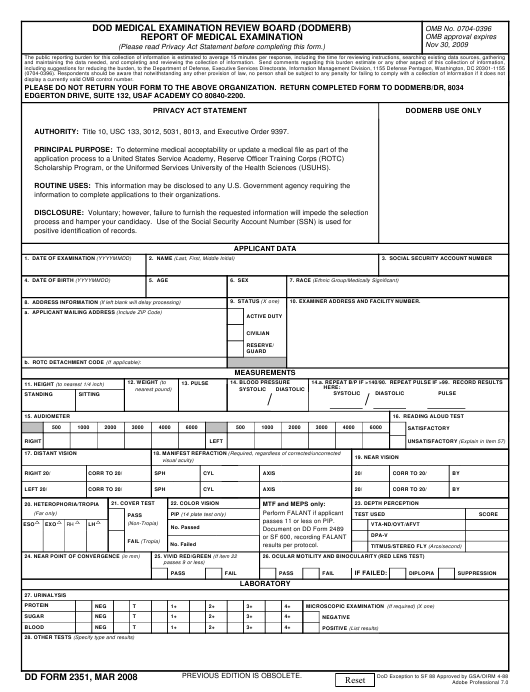 Download an up-to-date fillable DD Form 2351 down below in PDF-format or find it on the Department of Defense documentation website. EDGERTON DRIVE, SUITE 132, USAF ACADEMY CO 80840-2200. Scholarship Program, or the Uniformed Services University of the Health Sciences (USUHS). information to complete applications to their organizations. 10. EXAMINER ADDRESS AND FACILITY NUMBER. passes 11 or less on PIP. 56. EXAMINER: REPEAT BP AND PULSE IF RESULTS OF ITEM 14 AND 14a ARE >140/90 AND >99, RESPECTIVELY.